On the nights you are feeling particularly bold, karaoke is the answer. Some nights, all you want to do is sing your heart out. No matter where you are in Maryland, a microphone is close at hand. Below you’ll find 10 of the best karaoke bars in the state for when the only way to spend the night is living out your inner rock star fantasies. Hideaway in Clinton, Maryland, hosts “Dancing and Karaoke” every Wednesday, Thursday, Friday, and Saturday after 9 p.m. On Friday and Saturdays, the party doesn’t stop until 3 a.m. The atmosphere is warm, food tasty, and drinks cold. The Hideaway in Odenton, Maryland, bears no relation to the Hideaway in Clinton, Maryland, except for the excellent karaoke. They have a packed schedule with events nearly every night. 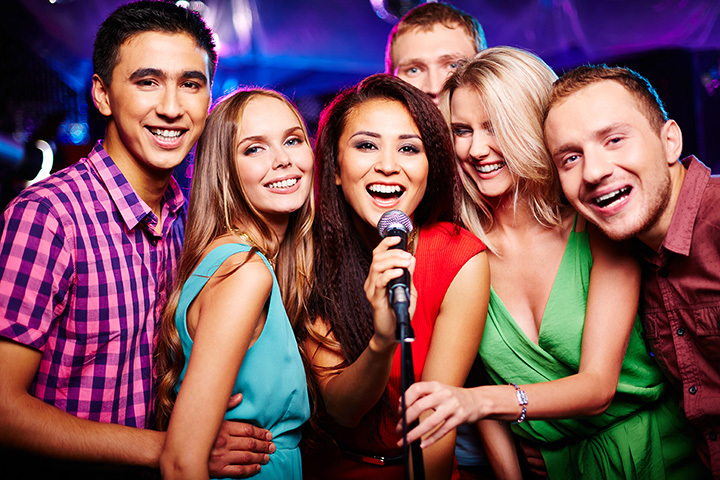 Friday night is karaoke night from 9 p.m. until 11:55 p.m. Celebrate with $5 Fireball shots and check the calendar for occasional Saturday night competitions. Karaoke is a mainstay at Grand Central. Stop in Monday, Tuesday, and Thursday nights starting at 9 p.m. for regular karaoke. The singing starts at 9 and doesn’t stop until the lights go out. Enjoy drinks, food, and good company while you sing to your heart’s content. Anthony’s Bar and Grill in Dunkirk, Maryland, is open every night until 2 a.m. Entertainment options include Wine Down Wednesdays, Luck of the Draw Darts, Kickball League meetings, and, of course, Wednesday Night Karaoke. Whether you’re coming in for lady’s night, trivia, or karaoke, you’re sure to have a great time. Barefoot Bernie’s in Hagerstown, Maryland, has karaoke night every Tuesday with a cash drawing. Barefoot Bernie’s is tropical themed and has fantastic food, tons of games, and a fine drink selection. Check their website for other upcoming events. Buckeystown Pub in Buckeystown, Maryland, is known for their charity efforts and for providing a friendly, local place for the folks of the town since 2004. They have weekly specials on food and regularly scheduled live music. Call up for karaoke times, as they can sometimes change. Shooters Sports Bar and Grill has tons of entertainment options, including five flat screen TVs, darts, arcane games, pool, touch tunes, and karaoke. Touch tunes is an app that allows you to check in and play the jukebox, as well as serving as “an on-demand karaoke machine!” The food is good and the beer menu is extensive. Columbia, Maryland’s Second Chance Saloon has over 100 beers on tap and a regularly updated event schedule. Thursday night is lady’s night and karaoke night. Start singing at 8:30 p.m. and let the good times roll all through the night. Hellas Restaurant and Lounge is a bit more upscale than many other karaoke hot spots, but that doesn’t mean the karaoke is any less great. The restaurant is known for their crab cakes, but also have several TVs showing the latest game and a lounge designated for singing. Grille No. 13 in Waldorf, Maryland, is a casual tavern serving Irish style food and Guinness, with daily drink specials. Entertainment is an important aspect of what they do, too. Wednesday is open mic night, Friday is the regular DJ dance party, and Thursday is their standing karaoke night. Singing starts at 8 p.m.—don’t be late. View more Maryland Bars and Saloons.